Marysville, WA Web Design - Graticle, Inc.
We’re an established website design business serving Marysville, Washington. Graticle is your single source for construction website design and development since 2009. We specialize in web design for contractors looking to take their existing website to the next level. At Graticle, we will ease your mind by creating a design that’s tailored to your business and message. Then, we walk you through the options to find the format that will best accomplish the goals you’ve established for your website. Need proof? Read any one of our 76 testimonials and browse our portfolio. 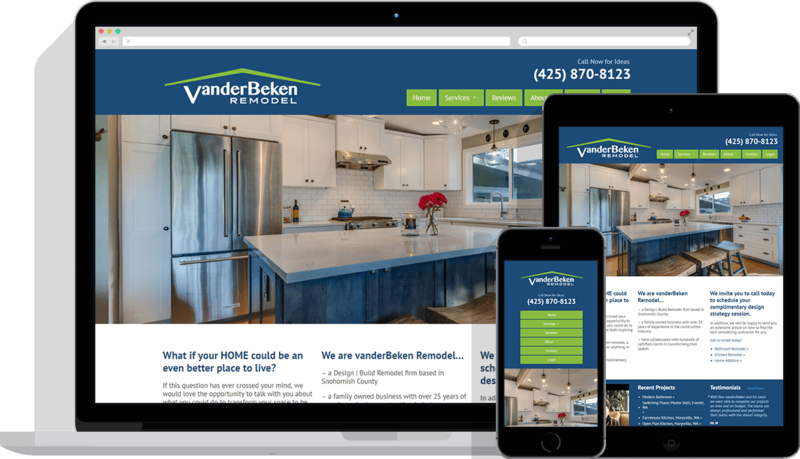 We designed and developed this website for vanderBeken Remodel located in Marysville, Washington. vanderBeken Remodel already had a website when they approached us for help. The problem was that it wasn't responsive (mobile-friendly) and it wasn't on a content management system like WordPress. We changed that. Their website is now built on WordPress. We also customized the backend of WordPress to allow the owners to edit the website themselves. Training videos were also created to help the owners understand how to update the website in the easiest manner. Lastly, their website is now mobile-friendly so that it can be viewed on all screen sizes beautifully. We've continued working with the team at vanderBeken Remodel for years and look forward to the helping them in years to come.